Contrary to what was portrayed in the highly fictionalized biopics of Al Jolson, i.e. "The Jolson Story" and "Jolson Sings Again," Jolson was married four times, not two. The films only mention his last two wives. At the time Jolson's career was beginning to take off, he married a woman named Henrietta Keller. They were married for more than eleven years--from the time of his early success with Dockstader's Minstrels, vaudeville, and his first appearances in such stage shows as "La Belle Paree," "Vera Violetta," "The Whirl of Society," "The Honeymoon Express," "Dancing Around," "Robinson Crusoe, Jr.," and "Sinbad." It was during this time then, when Jolson became arguably the major Broadway star at the time, that Jolson was married to Henrietta. This marriage was in trouble early on and ended in divorce. 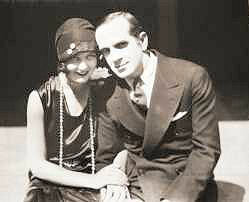 Jolson was married to Ethel Delmar (nee Alma Osborne) for less than four years. During this time, Jolson continued his success on stage with such hits as "Bombo" and "Big Boy." 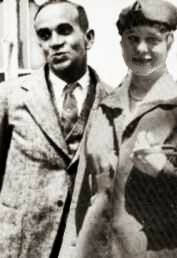 Ethel occasionally traveled with Jolson on the road as he performed, but also was often left at home when he went on the road. This became a lonely existence for Ethel. She wanted her husband home more; she also liked to have an active social life. Now she had neither. When he was home, Jolson would talk to Ethel about quitting the business or taking time off from show business to spend more time at home. There was even talk about adopting a child, and they started the ball rolling on this. Jolson, however, made promises he couldn't keep. Jolson most always wanted to perform to an audience; he was none too patient to sit at home very long. He was soon offered the starring role in the production of "Big Boy," and that was that. This was all too much for Ethel to bear. When Jolson was appearing in "Big Boy," Ethel was taking a ship voyage to Paris. Soon after, she filed for divorce.